Thank you for choosing Dentistry in Bellevue - Dr. Robert Gelb DDS. You’re the reason we love what we do. Sharing our loyalty program with you helps us show how much we appreciate your confidence in our team. All of us tend to put a lot of credibility in the recommendations of our friends and family. If you share our practice with others, we’ll send your gift after they finish their new patient visit. 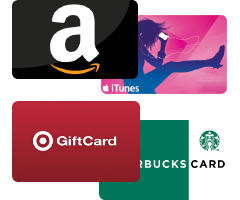 There’s no limit on how many gift cards you can receive. Just keep sharing us and we will keep the gifts coming your way! *Some Restrictions apply. Not to be combined with other offers. Contact our office for details. Amazon, Starbucks, Target, iTunes & their subsidiaries are in no way affiliated with this promotion and are to be held harmless. Rewards not valid through federal insurance plans.